According to the legend, "babas" were officially invented in Lorraine when Stanislas Leszczynski, Duke of Lorraine who lived in Nancy, found the kugelhopf dessert too dry, and asked that it be watered with rum. 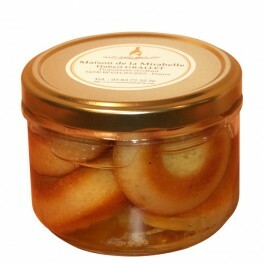 Many Lorraine confectioners had the brilliant idea to replace rum by our Mirabelle de Lorraine eau de vie. This great classic, tenderly soft mirabelle baba will delight all your guests. We suggest you to enjoy these small babas accompanied by whipped cream, custard, ice cream or fresh fruit.